Today at the St. Louis Cardinal game, Cardinal team members' wives were busy selling raffle tickets and autographed players cards to raise money for breast cancer awareness. I was priviledged to be pictured with Candice Greene (Kahlil Greene's wife), Ashley Barden (Brian Barden's wife) and Holly, a four year breast cancer survivor. Very lovely and hospitable ladies doing great work in their community! I have been very busy the last few months promoting Go Red! and getting more and more people in the Southern Illinois area involved and aware of heart health. Today, I mailed over 100 registration cards to the Chicago AHA office. Another 100 will be ready very soon and on their way too! Pictured below with me is Doug Devore, Executive Director of the Illinois Baptist Children's Home and Family Services. We appreciate his support! On Friday, May 1, 2009, I was invited to speak at the Galatia First Baptist Church for their Mexico themed Mother's Day Dinner. Everyone was so festive! We had a wonderful meal prepared by a great all-male cooking team, great music by the Praise Team, and fantastic fellowship with the women in attendance. I spoke with the large group about Go RED, getting registered online, and going for their heart health check-up as soon as possible. I shared the story of my journey in becoming Mrs. Illinois International 2009 and my Relationship Education platform that help to get me there. With some wonderful volunteers, we discussed what we "like" about ourselves and what the social expectation is for "modesty" -- which in turn actually keeps us from growing and being confident. In therapy, I focus on helping women to be complimentary of themselves both physically and emotionally, their children, and other women because we help each other grow individually and relationally when we are encouraging. In the end, the fastest route to being satisfied in a relationship is being satisfied with ourselves. Our beautifully courageous volunteers telling about themselves. They did a great job! The totally appreciated team of cooks and servers for the evening. Brandi Hankins, Mother's Day Dinner coordinator, me, her mother and two daughters. I so very much appreciated Brandi's invitation to come and speak to this group of women. The South Central Illinois Heartwalk was held in Mt. Vernon, Illinois on Saturday, April 18, at the Mt. Vernon mall. Holly Torbeck, Mrs. Vandalia International 2010 participated on a team and graciously invited me to attend. It was a fun morning meeting lots of people and hearing several survivor stories. There are such great people in Southern Illinois.My friend and sister queen Randa Allen, Mrs. Midwest International 2009, was also in attendance as the speaker at the opening ceremony for the day. She did a wonderful job! The following photos are snapshots from events throughout the morning. Students at CWCHS participated in their annual Teen Conference today, April 9, 2009. I presented to a wonderful group of young ladies who were interested in information about Go Red! and relationships. The title of our session was "Mean Girls -- Who they are, What they do, and Why." Learning how to navigate conflict and respond to bullying behavior among female friends is a much needed skill in any young, or even mature, woman's life. In summary, we focused on the fact that just about every female has participated at one time or another in mean girl behavior, but now understand that these acting out behaviors are a typical result of being a victim of those same behaviors. On March 31, 2009, I was invited to the state capital to be introduced during a session of the Illinois House of Representatives. Brandon Phelps, the Representative from my home district, was a wonderful host for the day. I met so many of our legislators and had many opportunities to discuss the ongoing need for Relationship Education curriculums in the schools for our teens. Below is Brandon Phelps, Representative of the 118th House District, and Senator Gary Forby, 59th District, posing for a picture on the Senate floor. Before leaving the capital that day, I had the honor of meeting our Governor, Pat Quinn, and briefly spoke with him about the great need for relationship training in our state. This school year, I have presented the SMART Education curriculum to 12 different classes at 5 Southern Illinois Schools. SMART Education (Saving Marriages And Relationships Together) is a seven session curriculum that I created and co-authored for The Illinois Baptist Children's Home and Family Services. It teaches teens to evaluate the personal experiences they have had in relationships and helps them to see their own interactions more clearly. Pictured below are the 7th & 8th grade students from NCO Grade School who are currently participating in the SMART Education program. To find out more about SMART Education, visit www.smartrelationship.com. 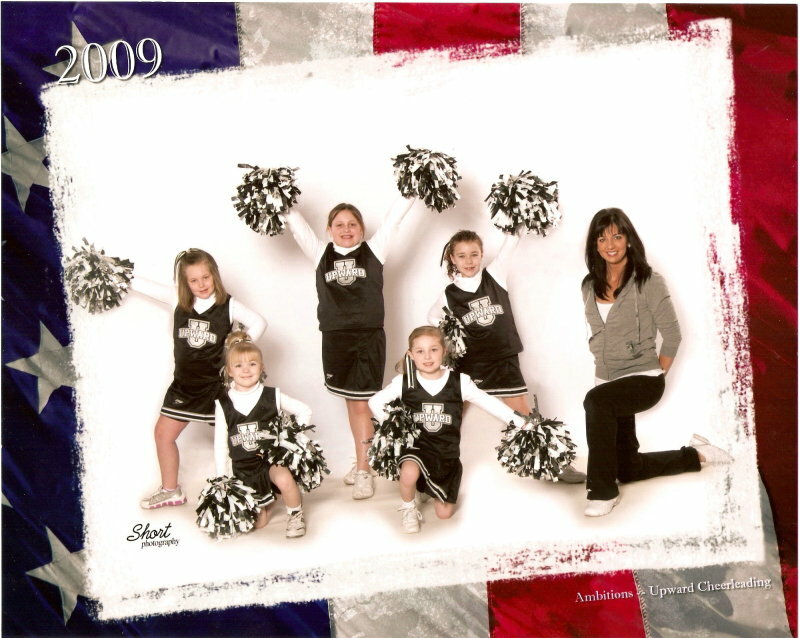 Upward Cheerleading -- It's Fun to be a Coach! Upward Sports is a Christian mission designed to reveal the winner in every child. "Every child plays. Every child learns. Every child IS a Winner!" Our Upward Cheerleading & Basketball Season began in January and ends on March 27th with a closing program by the Jesse White Tumbling Team. My cheerleading team, Ambitions, had a great season learning chants, cheers, and a super-fun pom routine. 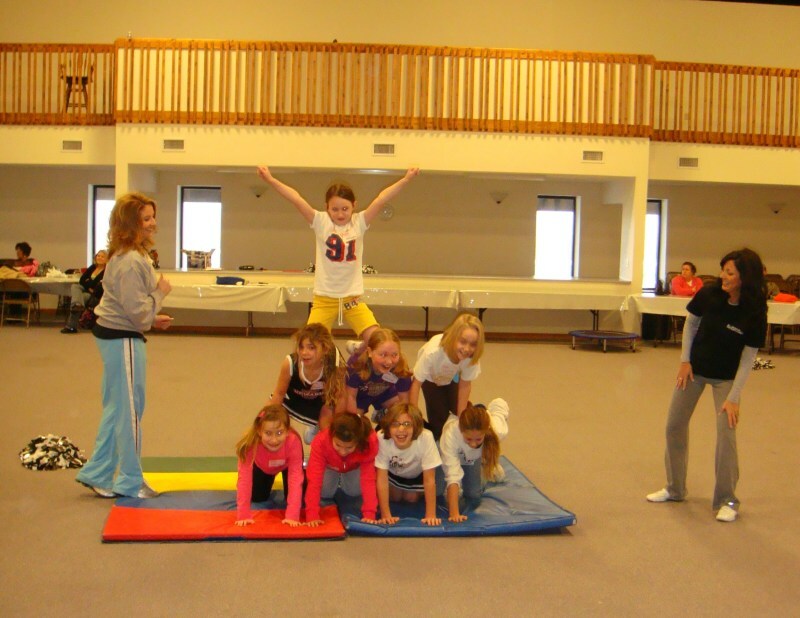 Our team consisted of 6 girls ages 5 to 7. With practices once a week and games on Saturday mornings, these girls really put in the hard work and it showed on the court! Before the season started we had a clinic so that all the participating cheerleaders could get an introduction of the things we would be doing throughout the season. I assisted with learning jumps and pyramids. For more information at Upward Sports visit www.upward.org. Our family loves Upward. 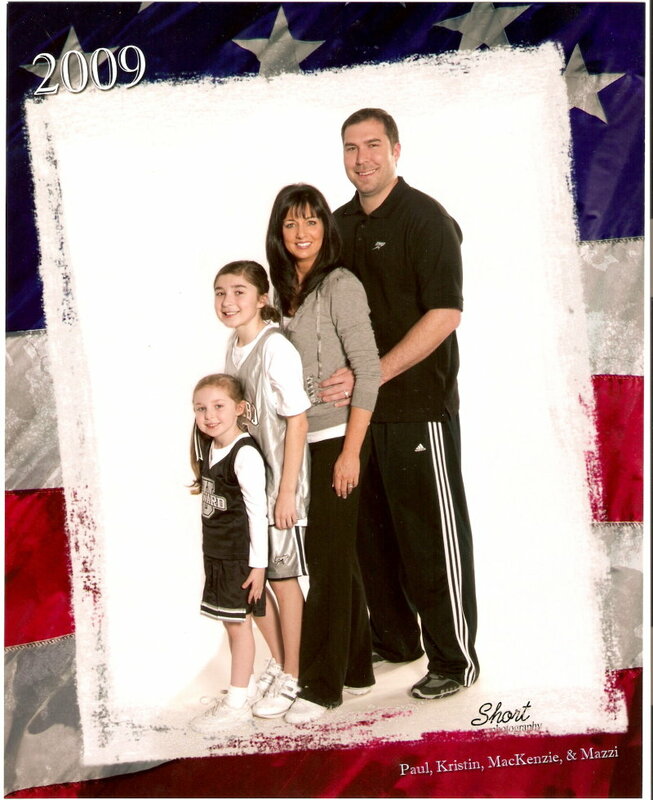 My husband, Paul helps to coach our oldest daughter's basketball team too! Memorable Moments state pageant was held on Saturday, February 28th. My good friend, Jayme Cowling, and I were priviledged to be the judges for the day for all contests ranging from birth to age 18, for boys and girls. Shannon and Mindy run a great pageant and worked very hard on the stage and picture area, which included a Cinderella carriage. All the contestants for the day were fantastically talented and it made our job difficult. Great job everyone! Helping with the Jump Rope for Heart event at Norris City - Omaha Grade School was a great opportunity to see how much support our younger generation has for heart health! They had a great time jumping rope and raised over $2,000.00. Below is a picture of the first grade classes in "mid-jump." I had the opportunity to meet our area American Heart Association representative Traci Ruda. Also pictured on the right is Sherry Kingston one of NCO's PE teachers who made Jump Rope for Heart an activity for NCO. Pictured here is the 5th grade class who participated in both Jump Rope for Heart and Hoops for Heart. Today I was able to share information about heart healthy choices with some very young at heart. The assisted-living residents at Brookstone Estates in Harrisburg, IL were very welcoming and I enjoyed myself so much! We talked about the ABC's of heart health and about Go Red. There were many ladies interested in signing up to receive information from Go Red. My youngest daughter, Mazzi, and I also had a wonderful lunch with the residents as we visited after the presentation. A very special man in my life was there today -- my grandpa, Leslie. I was also very excited to get my picture taken with the recently crowned Valentine Queen of Brookstone, Mrs. Boyke! Today I was invited to speak at the break between each Upward Basketball game at Star Chuch in Eldorado, IL. This program reaches 12 surrounding communities in 3 Southern Illinois Counties. I was able to share my platform, Go Red, and my testimony for how God has prepared me in my life to over 400 people throughout the day. Between speaking times today, I was able to sign women up for Go Red and talk to some individually about my Relationship Education platform. I also loved getting the opportunity for photos with many of the Upward Basketball Players and Cheerleaders. Go Red Day started very early in the morning on Friday, February 6th. Christine Boll, Miss Illinois International 2009 and I met at the Chicago NBC station before 6am. We were able to meet some very amazing women, Elizabeth and Helen -- both survivors of heart disease -- that share their amazing stories with others in hopes to help prevent women from ignoring the signs of heart problems. We also were able to get pictures with two members of the NBC5 News Team. On the left is Rob Elgas and on the right is Andy Avalos. I was also able to give a donation to the American Heart Association from the fundraiser I held in January. A huge thank you goes to the wonderful people who helped with a successful fundraiser for Go Red! A very fun afternoon with some real Christmas beauties! October is Breast Cancer Awareness Month and the Illinois Beauty Queens supported the Making Strides Against Breast Cancer Awareness walk in O'Fallon, Illinois. I was proud to be there with some very lovely and queenly friends! Pictured are Julie Rinehart, Mrs. Illinois America 2006; Morgan Dickey, Mrs. Illinois American Image 2009; Holly Torbeck, Mrs. Southern Illinois Galaxy 2009; Kristin Melton, Mrs. Illinois International 2009; and Randa Allen, Mrs. Illinois International 2007. Randa is a breast cancer survivor and we were all so glad to be there supporting her and breast cancer awareness. Riding in the Harrisburg High School Homecoming Parade was a very big event. Lots of people were present to cheer on the Bulldogs. I am proud to say that I grew up in Harrisburg and I am purple & white through and through. This homecoming parade and weekend marks mine and my classmates 20 year reunion. September 27, 2008 -- Today was the Norris City Dairy Day Parade. The White County, Illinois Queens were there enjoying the parade and looking beautiful. Two of my closest friends were also there to help with parade prep. I couldn't have done any of this without them! September 26, 2008 was the Dairy Day Princess, Junior Miss and Miss Pageants. Dairy Day is our hometown festival in the fall season. I was announced for the first time in our community as Mrs Illinois International 2009.